Sparkly gift guide: $25 and under. You are here: Home / Jewelry / Bracelets / Sparkly gift guide: $25 and under. Welcome to the first edition of Diamonds in the Library’s holiday gift guides! I’m a little late for Hanukkah (or right on time, depending on which night you want to give gifts!) but there’s no bad time of year to give the gift of jewelry. Jewelry is one of the most dependable gift choices, as long as you understand the taste of the person you’re buying it for. I love receiving jewelry from people I care about – every time I wear it I’m reminded of the person who bought it for me and the fact that I matter to them. Beautiful jewelry can be expensive, but it doesn’t have to be. Today we’ll be looking at pretties that cost less than $25. I’ll be inching upwards in price with each new gift guide – tune in tomorrow for $25-$50. This BaubleBar bracelet stands out in every way – shape, color, and texture. It looks far more expensive than it is. Also comes in green. 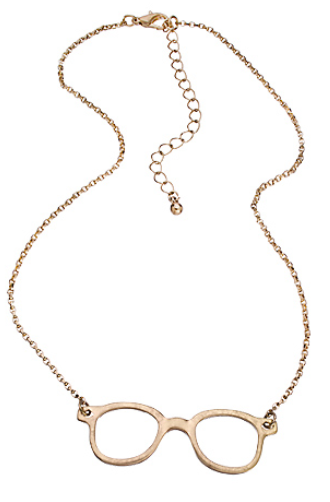 This lovely little necklace would add a pinch of sparkle to any outfit. “skinny minnies” look like they’d be perfect. What a cute way to add a little pizazz to an outfit. 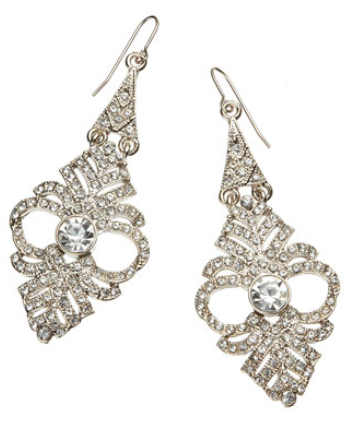 These classic, lacy earrings are destined to become a wardrobe staple. These are simple but beautiful, with their bright color and lacy gold edging. How fun is this one? A great staple – I’ve seen similar things for much more money. These are wonderful everyday earrings – they’d be great with business casual outfits. but that one was rather large and chunky and this one is delicate. Buy it for your favorite librarian, editor, or bespectacled buddy. Come back again tomorrow to see the next tier of the Diamonds in the Library gift guide: pretties from $25 to $50!